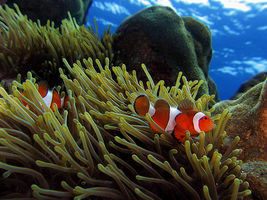 Clown Fish and Sea Anemones: Talk About Teamwork! 1 I love being a part of a team. I really like the way my teammates and I help each other. Did you know that some animals use teamwork? The clown fish and the sea anemone are great teammates. Both of these animals live together in the ocean. They are very different from one another. But they still make a great team! 2 Sea anemones look like underwater flowers. They have tentacles that sway with the sea current. Their tentacles look pretty, but they are poisonous. When a fish swims into an anemone tentacle, it gets stung. The poison then paralyzes the fish. The paralyzed fish then becomes anemone food. 3 Clown fish are very colorful. They live in or near sea anemones. Unlike other fish, they are not bothered by the anemone poison. Clown fish are covered with a special type of mucus. This mucus keeps them safe. These bright fish carefully swim in and around sea anemones. When they are swimming they gently bump into the swaying tentacles. The clown fish do this over and over again. This allows the fish to become immune to the anemone's poison. Now the fish and the anemone can live together. They can help each other too. 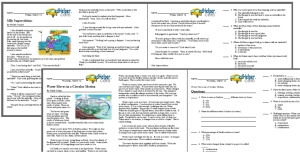 Feedback on Clown Fish and Sea Anemones: Talk About Teamwork!